Small Antlers may be dropped by female elk, whereas male deer and elk drop large antlers. Peddlers may be randomly encountered in the wilderness (typically being attacked). These peddlers have an 8% chance of carrying 1-3 samples. Various ingredient-specific barrels have a 17% chance of containing 1-5 sample. Uncommon- and rare-type apothecary's satchels have a 2% chance of containing one. 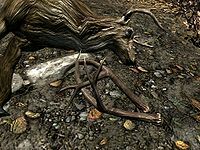 Warlocks and Forsworn have a 0.5% chance of carrying one. There is a 50% chance that a female elk will drop small antlers, in addition to venison and deer hide. This page was last modified on 3 June 2018, at 18:00.